The task of auditing an account can sometimes seem daunting, especially if it’s a larger scale account. With that can come the feeling that every opportunity or issue needs to be corrected immediately, which may not be realistic. If you approach your account audit with a set list of statements to grade based on a scale of 1 to 4, with 4 meaning there doesn’t seem to be any issues, you can rank overall account categories and prioritize findings. Statement example: Ad copy is customized for each ad group, utilizing ad group keywords within the ad. You can create a list of similar statements for each account category including ad copy, account settings, landing pages, etc. Once you have your grades, you can use charts to create a visual representation of your account strengths and weaknesses. You can also compare your score to any other accounts you manage and determine which has the most opportunity. Below is an example of an audit worksheet we use at SEER. If you’re a part of a larger team of individuals with PPC experience, asking someone else to audit your account can sometimes uncover a lot more opportunities than you might find on your own. At a certain point, account managers can become accustomed to their own settings and approach to campaign management that smaller details can get overlooked. Are you targeting the correct languages based on your location targeting? Is your ad copy as strong as it could be for ad groups? Do your keywords need some match type adjustments or stronger organization? Someone new to the account may have a different opinion than you. Not a part of a larger team? If you have access to an engine rep, request things like a Campaign Settings Anomaly Report, Conflicting Negatives Report, or Budget Utilization Report which can easily be pulled for you. Many of these types of alerts are also integrated into the engine UIs so be sure to review things like your opportunity tab regularly. 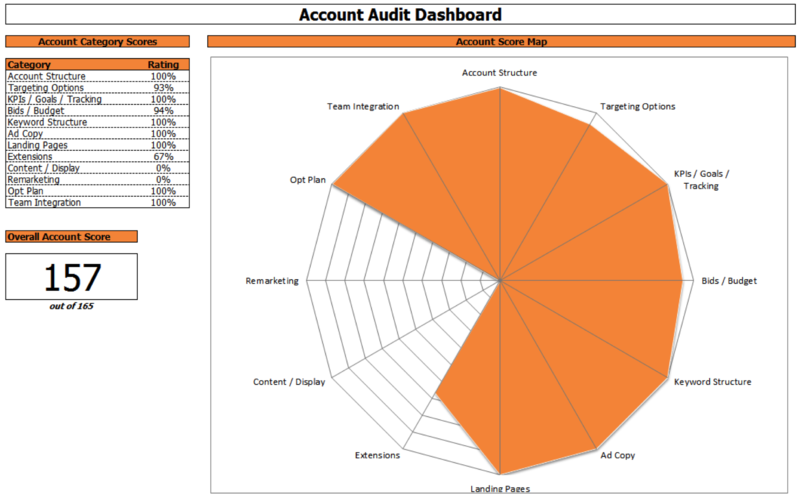 Your account audit doesn’t need to stay within the engine UIs or editors. Once you’re done reviewing your ad copy for keyword relevance, landing page relevance, and clear calls to action, see what they actually look like in the SERPs! Best practice is to always use the ad preview tools within the UI so you’re ads aren’t accruing lost impressions, but with how frequently the SERPs and ad formats change, sometimes you need to perform a live search to see how your ad responds. Your ad might have a great stand-alone Description Line 1 and Line 2, but when Google puts them together, don’t you sometimes wish there was proper punctuation? These are just a few things to consider during your next round of audits. Feel free to share any other tips or best practices you have.